Trigger finger is a condition in which your finger or thumb ’catches’ or gets locked in place when you bend it. It’s not harmful, but it can be painful and a nuisance. Sometimes it recovers by itself after a few weeks but if not, there are treatments that can help. We’ll use the term trigger finger here, but our information also covers the thumb, which is often affected. Trigger finger is caused by a problem with a tendon in your finger. Tendons are long cords that run along the length of each of your fingers, connecting your finger bones to the muscles in your forearms. They run through a tunnel (called a tendon sheath), which has bands of tissue that hold your tendon in place, called pulleys. This system normally allows your tendon to move smoothly as you bend and straighten your fingers. If you have trigger finger, the tendon sheath narrows, and so the tendon can’t run through it smoothly. This can irritate the tendon and cause a nodule (a small lump) to form on your tendon. The clicking or popping sensation you get when you move your finger is caused by this nodule catching on a pulley in the tendon sheath. If the problem becomes severe, your finger can sometimes get stuck (locked) in a bent position. People of any age can get trigger finger (including children) but it’s most common between the ages of 55 and 60. It’s more common in women than men. People with diabetes can be more prone to developing trigger finger. Symptoms of trigger finger can include the following. A painful catching or popping sensation when you bend and straighten your finger. Your finger getting stuck (locked) in a bent position – you may be able to pull it straight with your other hand. You may be able to feel a sore lump in your palm at the base of the affected finger. Stiffness in your finger, which may be worse first thing in the morning. You may also notice early signs of trigger finger in your other fingers, on the same or the other hand. The symptoms will tend to develop over weeks and months. See your GP if you’ve noticed these symptoms. Your GP will ask about your symptoms and examine your hand. They may also ask you about your medical history, and whether there’s anything that could have set off your symptoms – like an injury, or repeated stress on your finger. Your GP will feel the affected finger to see if there’s tenderness or a nodule in your palm at the base of the finger. They may ask you to bend and straighten your fingers, while they feel the palm of your hand. This may allow them to feel the catching of your tendon. Tell your GP if your hand is painful so that they know to take extra care when examining it. You won’t usually need to have any tests. But if there’s any uncertainty about what’s causing your symptoms, your GP may recommend you have an ultrasound scan. Sometimes, trigger finger gets better without any treatment. Your doctor may advise you to rest your hand, and try not to do any activities that make it worse for a while. If you have mild symptoms, you might find that they go away on their own within a few weeks. If the problem doesn't go away after a few weeks, you may want to consider treatment. There are a number of treatment options if your trigger finger does persist. These include painkillers, splinting, steroid injections and surgery. Your doctor may recommend that you try a combination of splinting and pain relief for four to six weeks to see if this helps. Your hand specialist can fit a splint for you to put on your finger or thumb at night to keep it straight and prevent it moving. This aims to reduce the friction between the affected tendon and the tendon sheath, reducing your symptoms. You can take over-the-counter anti-inflammatory drugs, such as ibuprofen to reduce pain and swelling in your finger. Always read the patient information leaflet that comes with your medicine and if you have any questions, ask your pharmacist for advice. As an alternative to splinting, or if splinting doesn’t help, your doctor may offer you a steroid injection. Your GP or hand specialist will inject a steroid medicine into the inflamed area of your tendon sheath. The steroid may be mixed with a local anaesthetic medicine. You may see an improvement a few days after the injection, but it can take a week or two before you notice any difference. You may have some pain in your hand for a day or two after the injection. If the first injection doesn't help, your doctor may offer you another one. Steroid injections don’t work for everyone. If there’s no improvement in your symptoms after having steroid injections, you may be offered a small operation to treat your trigger finger. Surgery for trigger finger may be called ‘trigger finger release’. You’ll usually only be offered surgery if all other types of treatment haven't worked. Surgery may be the best option if your finger is permanently locked. Surgery is usually a permanent solution to the problem. The aim of surgery is to release the restricted pulley in the tendon sheath, which is blocking movement. This should allow your finger to move normally again, as well as stop any pain. You’ll usually be able to have the procedure as a day-case procedure (you won’t need to stay in hospital overnight). You’ll have an injection of local anaesthetic so that the area will be numb and you won’t feel any pain, but you’ll stay awake during the procedure. Your doctor may perform the procedure as open surgery (through a small incision in the palm of your hand). Or, they may use a needle inserted into your hand – a procedure known as percutaneous trigger finger release. Your doctor will explain how they will do your procedure, and discuss any possible risks with you beforehand. You’ll be encouraged to move your finger straightaway after the surgery. You might get some temporary swelling or soreness after the procedure, and your finger or thumb might feel a bit stiff at first. It can take several months for the swelling and stiffness to go away completely. 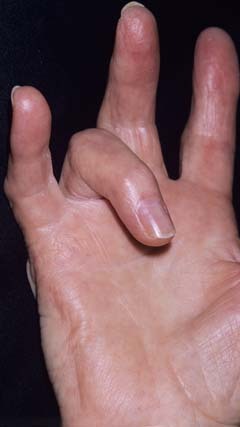 Trigger finger is caused by inflammation of the tendon that bends your finger, causing it to catch on the tendon sheath. It’s not always clear exactly why some people develop trigger finger. But intensive or repetitive manual activities that involve your fingers, or that put pressure in the palm of your hand, can sometimes set it off. There isn’t much you can do to prevent trigger finger. Although if you start to notice symptoms, it’s worth taking note of anything that seems to cause them, and avoiding those activities for a while. You can sometimes get trigger finger at the same time as other conditions affecting your hand and wrist such as Dupuytren’s contracture (Dupuytren’s disease) and carpal tunnel syndrome. See our frequently asked questions for more information. What’s the difference between carpal tunnel syndrome, Dupuytren’s contracture and trigger finger? What’s the difference between carpal tunnel syndrome, Dupuytren’s contracture and trigger finger? Trigger finger, carpal tunnel syndrome and Dupuytren’s contracture are all conditions that affect your hand or fingers. They are separate conditions caused by different things, but it can be easy to confuse them, and it’s possible to have them at the same time. Trigger finger is caused by a problem with a tendon in your finger, which causes your finger to click or lock when you bend it. Carpal tunnel syndrome is caused by pressure on a nerve in your wrist, which leads to pain, numbness and tingling in your hand and fingers. Dupuytren’s contracture (or Dupuytren’s disease) is caused by ligaments in your palm thickening and contracting. Over time, this pulls one or more of your fingers into your palm. Having diabetes is a risk factor for all three of these conditions. Can children have trigger finger? Can children have trigger finger? Yes, trigger finger can affect children but it's more common in adults. In children, it’s usually the thumb that’s affected. Most parents of children with trigger thumb notice there’s a problem between the ages of one and four. If your child has trigger thumb, you may notice that one or both of their thumbs is held bent. Trigger thumb isn’t usually painful in children. For most children (up to six out of 10), trigger thumb gets better without having any treatment. If your child’s thumb is locked (stuck in a bent position), they may need surgery to correct it. Ask your doctor what the options are for your child’s particular circumstances. What happens if I don’t get my trigger finger treated? What happens if I don’t get my trigger finger treated? This depends on how severe your symptoms are. It’s possible that your symptoms may go away on their own, without any treatment. This is more likely if your symptoms are mild. If your symptoms are severe though, or you’ve had them for more than 6 months, your finger may become permanently locked in a bent position. You may find the pain unbearable too. Surgery will usually help to resolve the problem. It’s your choice whether to have any treatment for your trigger finger. But if your symptoms are severe, then you’ll probably find they’ll start to interfere with your daily life more and more. Talk to your doctor to find out more about treatment options, and how they may be able to help you.